The most obvious surveillance cameras are similar in design to the ones shown below. They can be found in many other places around Area 51 where roads enter the restricted area. They usually sit on a hill slope just inside the border, with a clear view of the road and the surrounding terrain. The two cameras below are placed quite visibly on a hill on the south (left) side of Groom Lake Road, where it enters the restricted area. Most of the other cameras that we have found are harder to spot. When you get to the border on one of the dirt roads, look for metallic reflections on nearby hill slopes. 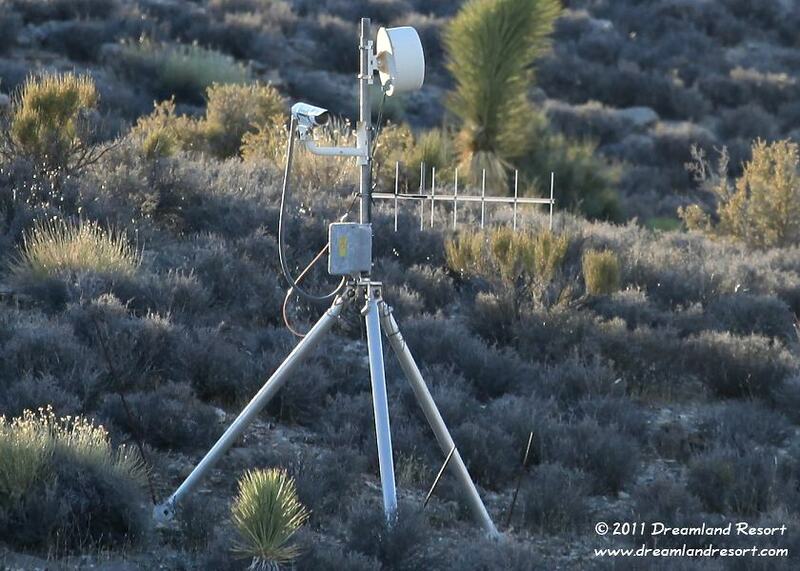 These are the two cameras near Groom Lake Road. The cameras are stationary, mounted on a tripod. A solar panel on one of the legs supplies the power for the electronics module in the gray box. There are two antennas: A UHF antenna and a microwave dish. They usually point to the radar installation on top of Bald Mountain. The Bald Mountain station, which has line of sight to almost the entire Tikaboo Valley, seems to operate as a relay station for the video signal from the cameras. The video signal is likely transmitted to Bald Mountain through the microwave dish. The UHF antenna may be used to receive remote control signals, or as an auxiliary video uplink, in case the microwave uplink fails. In July 2001 we noticed that the solar panel, which can be seen in older photos, was missing from one of the Groom Lake Road cameras. This, along with other observations, leads us to believe that at least some of these cameras are no longer in use. They may have been replaced by a different, probably far less obvious, surveillance system. Just like a few years earlier some of the old road sensors, the cameras were probably left in place to divert attention from the new system. There is a large remote-controlled surveillance camera on the top of Bald Mountain, which can cover most of Tikaboo valley. This camera is much larger than the tripod cameras, and most likely has much more powerful optics. We have seen it pointed in different directions and follow our moves in remote areas over 10 miles away. 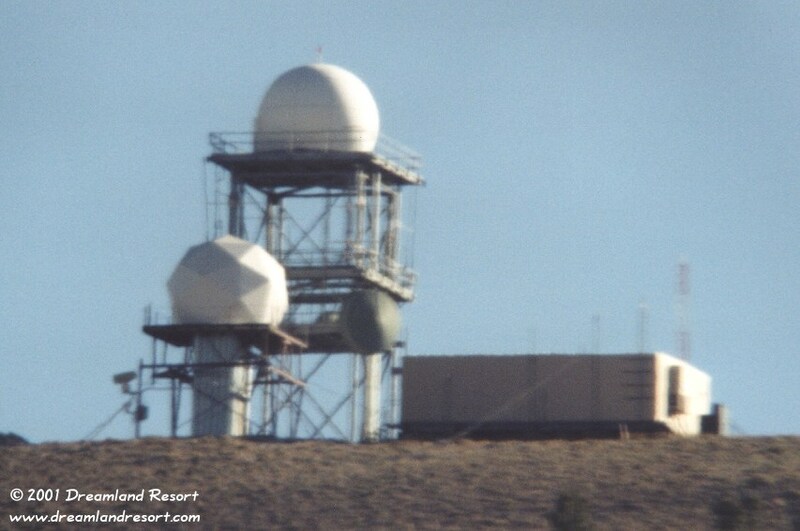 This photo shows the Bald Mountain camera on the left side of the support structure for the lower radar dome. 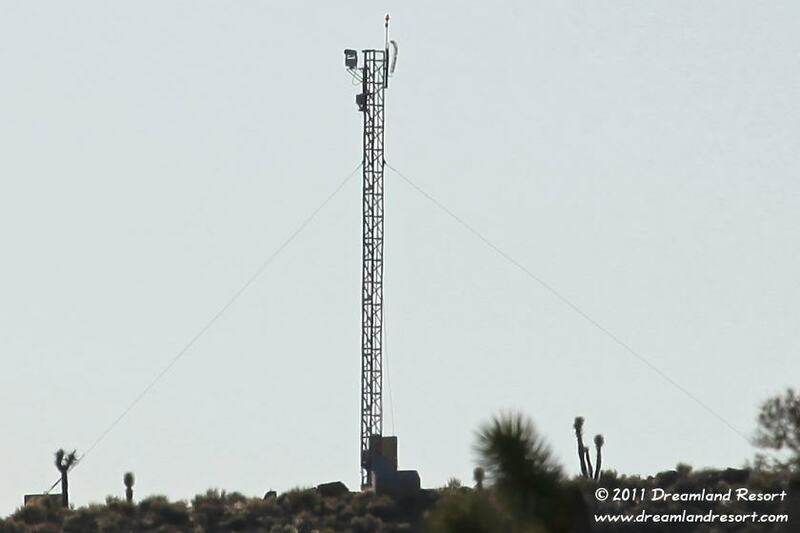 This camera tower was set up on a hill 0.2 miles south-east of the Groom Lake Road guard shack between June 2005 and October 2006. 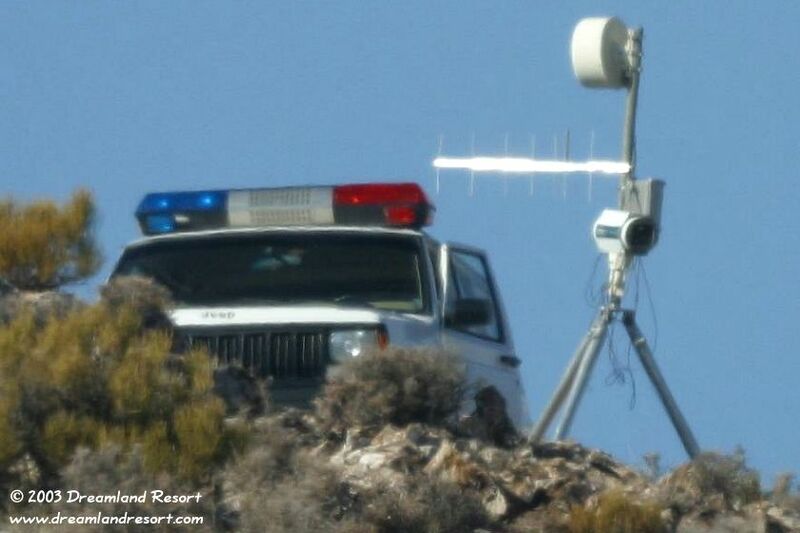 The remote controlled camera at the top has a clear view of the hills surrounding the Guard Shack, including the former Area 51 view spot Freedom Ridge. It also covers parts of Groom Lake Road, from a couple of miles outside the perimeter all the way back to Hwy 375. To the other side, the camera also has a clear view of parts of Groom Lake and Area 51. Still, the tower is only visble from a few locations on public land. Click here for more information. 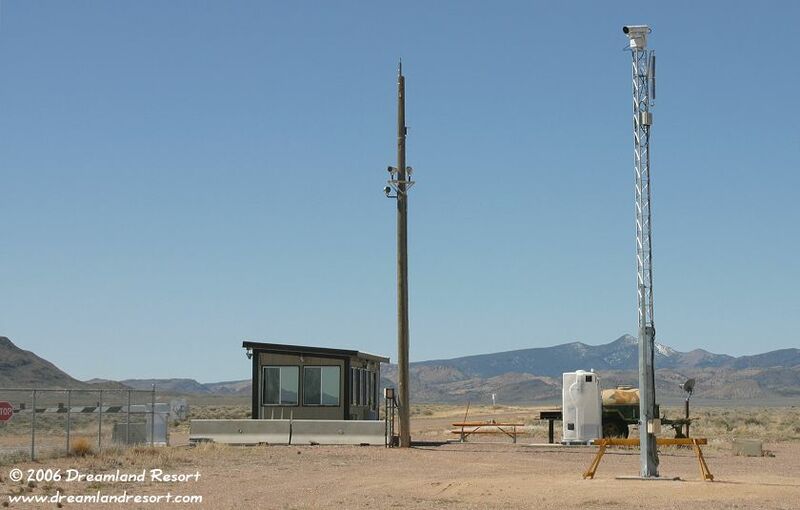 This remote-controlled camera was added at the Area 51 Back Gate in late 2005 or early 2006. The guard shack does not appear to be manned all the time any more, at least not on weekends. Instead, this new camera tracks curious visitors. More cameras, with a fixed angle of view, can be seen on the pole next to the new guard shack. Click here for more information. 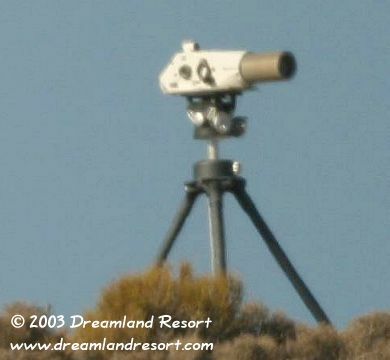 Here are some interesting new camera designs that Chuck Clark found on January 5, 2003 near the former Area 51 view spot Freedom Ridge. Both cameras are mounted on a hill inside the boundary. The enlarged photo on the left shows that the second camera's tripod has a manual gear head for fine positioning, which would indicate a strong magnification. BTW: No, the base does not employ shrinkheads. The appearance of the bonus-cammo above has been slightly altered to protect his identity. Photos by Chuck Clark, with friendly permission. This array of three Passive Infrared Intrusion Sensors that Chuck found in January 2003 is part of the Mini Intrusion Detection Systems (MIDS) by Qual-Tron, Inc.. 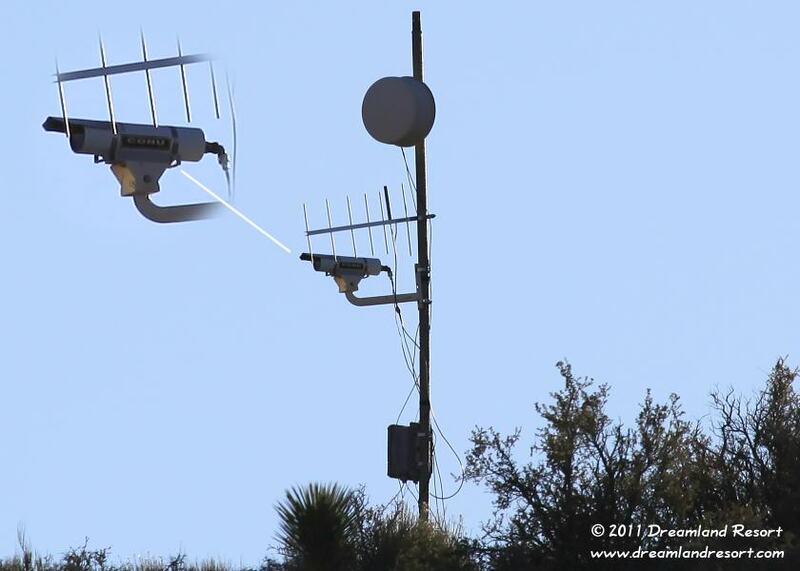 The New Road Sensors around Area 51 are also part of that system. Photo by Chuck Clark, with friendly permission.